The park was just getting into the swing of spring compared to the chilly recce we did in March and many of the paths had also been resurfaced. With it being the school holidays and the first really warm weekend of the year we were expecting the place to be packed with walkers and cyclists but it really wasn’t that bad. Even alongside the river where the paths were narrowest it wasn’t too busy, although not being a swimmer, Ruth found getting close to the water’s edge when passing oncoming cyclists rather unpleasant. Wearing a prosthesis with all the nautical attributes of a very expensive anchor I can empathise – I’m told by a canoeing friend that canals only come up to your waist, but I have no intention of putting it to the test! Of course, as predicted, we knew we would have some trouble with gates and chicanes here. 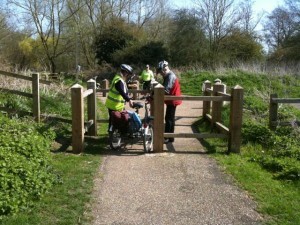 However, with Roger scouting ahead we avoided the worst of the obstacles that would have meant man-handling the trike over rather than through or around. There was more dismounting than we’d have liked but we didn’t let it spoil our day. 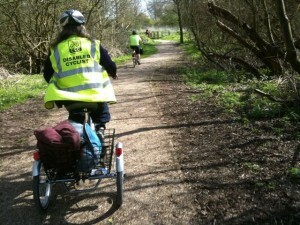 Which reminds me, despite Janet giving me details of a local disabled cycling advocate with a particular interest in Lee Valley Park, I’m afraid inviting him along for the ride dropped off the bottom of my to do list. Neal, if you’re reading this do get in touch and I’d be happy to provide you with any pictures or info from our day in the park that might help your project. 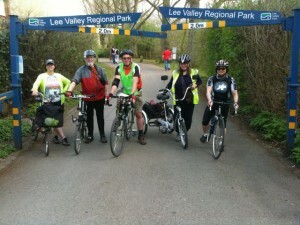 Getting back to the ride… the sun shone, the birds sang, the coffee flowed and the cake, er, was nice. That was the first stop. 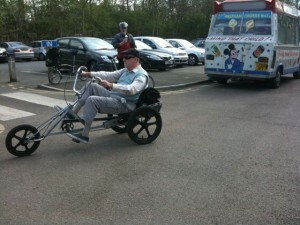 Later on we came across an ice cream van and an american recumbent trike. The chap riding this Trailmate first tried it out in the US of A, and when he couldn’t find anything similar in the UK he had one shipped over. It fitted in the back of his estate car with the rear seats down which is out of shot in the carpark. We finished up at the youth hostel with a coffee from their proper coffee machine and some discussion about where we’ll be going next; the Cheshire Plains on the weekend of the 12th of June, once we’ve found a suitable venue and accommodation. Lee Valley Youth Hostel worked out very well: the food was good, the staff were friendly and helpful, and being right next door to the station and the park was ideal – it’ll be a hard act to follow. 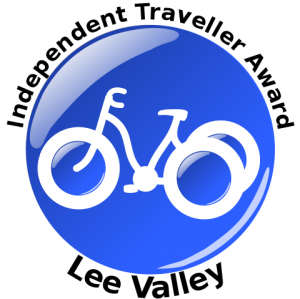 The Independent Traveller Award went to Ruth – first for arranging with National Express East Anglia to take her trike on the train into Liverpool Street and back out to Cheshunt, and then for persevering when the lady on the ticket barrier at Ipswich refused her access. And on top of that, when her return journey was disrupted by engineering works meaning a bus replacement service, Ruth ventured into new territory and took an alternate route home via Cambridge.